Stickers and patches and pins.....oh my!!! Well, we may be called Yujean Stickers but we are so much more than that! 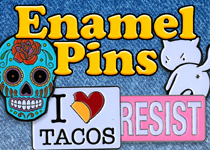 Over the past few years, we've brought on great new products like pouches, metal signs, tees and totes, and amazing, top quality enamel pins, and our customers are LOVING them! As always, it's about the art, about the quality, about the trend!! We work from our friendly offices in Eugene, Oregon, bring our dogs to work, love what we do.....and we hope it shows. 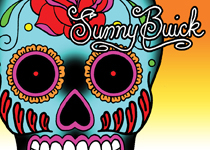 Our amazing artists are creating great new designs for our great swag every day...funny, edgy, slightly subversive Skool Daze tees and stickers.....Rainbow LGBTQ Pride gear.....Denim jackets are hot, enamel pins too, and so are our incredible iron on patches!! 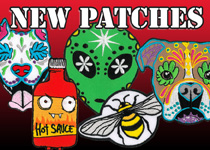 Peace, hippie swag, Aliens and more!! Dig in. Check us out. The list would have to be a mile long to link to everything we have, so trust us--we have something for YOU! You can see our very latest intros here! 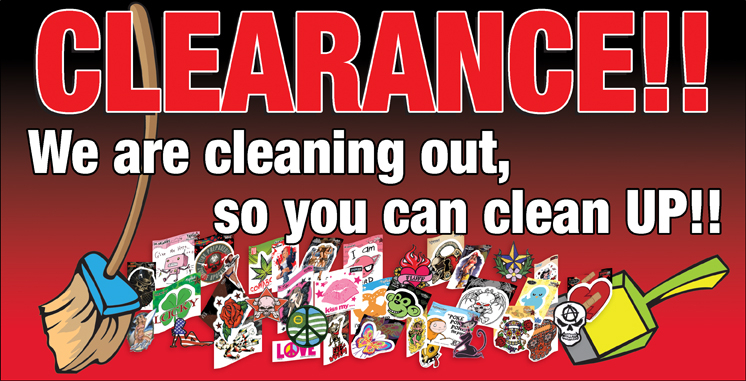 AND don't miss our new CLEARANCE!! section! We are cleaning out some old favorites to make room for new product. Incredible, first quality product at big markdowns! Have a store? Need a wholesale account? Set up your new web account under Wholesale Login above. We have rack programs and display options available. Talk to us about how we can help your bottom line--and give your customers the great stuff they want. OVER THE 35 YEARS WE HAVE BEEN IN BUSINESS, WE HAVE WORKED WITH RETAIL SHOPS AND SMALL CHAINS, FESTIVAL AND FLEA MARKET SELLERS, ONLINE SELLERS AROUND THE WORLD, AND IT IS THE CORE OF OUR BUSINESS. REACH OUT. WE'D LOVE TO HELP!! Let us know how we're doing! Email us at info@yujean.com, and follow us on Facebook.